The great auk by John James Audubon. : University of Pittsburgh/WikimediaThe great auk, Pinguinus impennis, was a large, black and white bird that was found in huge numbers across the North Atlantic Ocean. It was often mistaken to be a member of the penguin family, but its closest living relative is actually the razorbill, and it is related to puffins, guillemots and murres. Between 1830 and 1841 several trips were taken to Iceland’s Eldey Island, to catch, kill, and sell the birds for exhibitions. Following a period of no reported captures, great auk dealer Carl Siemsen commissioned an expedition to Eldey to search for any remaining birds. 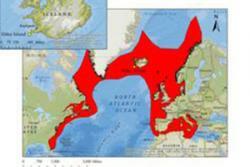 The great auk’s breeding range across the North Atlantic. 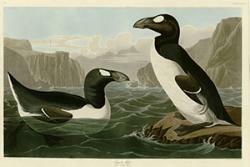 : Maps were created using spatial data from BirdLife International/IUCN with National Geographic basemap in ArcGIS., Author providedIn 1999, great auk expert Errol Fuller proposed a list of candidate specimens, the origins of which were not known, which he believed could be from the last pair of great auks. But how to find which of these were the true skins? For this we turned to the field of ancient DNA (aDNA). In the last 30 years, aDNA technology has progressed greatly, and has been used to address a wide range of ecological and evolutionary questions, providing insight into countless species’ pasts, including humans. Museum specimens play a key role in aDNA research and have been used to solve several issues of unidentified or misidentified specimens – for example Greenlandic Norse fur, rare kiwi specimens, Aukland island shags, and mislabelled penguin samples. The results showed that the skin held in the museum in Brussels was a perfect match for the oesophagus from the male bird. Unfortunately, there was no match between the other candidate skins and the female’s organs. The specimens from Brussels and Los Angeles were thought to be the most likely candidates due to their history: both birds were in the hands of a well-known great auk dealer, Israel of Copenhagen, in 1845. As the bird in Brussels was a match, we thought it likely that the one in Los Angeles would also be a match for the female’s organs. It was surprising when it wasn’t. However, our research led us to speculate that a mix up which occurred following the death of Captain Vivian Hewitt in 1965 – who owned four birds which are now in Cardiff, Birmingham, Los Angeles and Cincinnati – was not resolved as once thought.